Dreaming of a Fight Christmas. CHRISTMAS WITH THE KRANKS is about selfishness, viciousness, hypocrisy and homogeneity – you know, the true spirit of Christmas. From a John Grisham novel, Skipping Christmas (which I presume is as compelling as his other books – and therefore nowhere near as asinine as this movie), KRANKS is about middle-aged upper-class couple Luther and Nora Krank (Tim Allen and Jamie Lee Curtis) who decide to “skip Christmas” when their beloved daughter leaves for overseas. But the neighbors won’t let them, cursing, terrorizing, belittling and ostracizing them from the community until the Kranks yield to communal pressure; until they step in line with the prescribed collective psychosis. You see, the Kranks are hooked into traditions of donating to many town charities, purchasing Christmas goods from the town vendors, throwing the best parties – in other words, other people’s fun and profit depends on them staying in town and paying their dues. Rewritten for the screen in a blind haze by Chris Columbus, directed by Joe Roth like he was distracted by Jamie Lee Curtis’s bad hairstyle, CHRISTMAS WITH THE KRANKS is a fake-smile, mean-spirited, half-baked stinkfest. 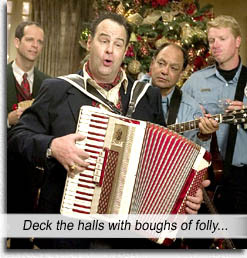 Dan Aykroyd is the town burgomaster, whose iron hand decrees the Kranks shall be terrorized for their omission: empowering kids to phone them incessantly in protest, hammering “Free Frosty” signs into the Kranks’s lawn (next it will be a burning cross and no one will think twice), publicly humiliating Nora for not buying Christmas cards, terror-caroling, veiled threats and petty vengeful acts. In the true spirit of Christmas. Luther has bought tickets for a Caribbean cruise which leaves on Christmas day, but daughter phones and informs she is unexpectedly returning for Christ’s mistaken birth date. So for the sake of daughter having a traditional Christmas (whatever that means) the Kranks decide to stay in town and have their vaunted party. Okay – but at what point did the filmmakers think that the decision to not tell daughter of their other plans was a funny one? The Kranks’s recant now gives the townsfolk even more grist for their vengeance mill, as they extort Luther for every article he needs to make the ruse believable, making life as hard as possible for him. Nora goes shopping for a ham and ends up in a gladiatorial battle with an old lady for it. Comrade Aykroyd gathers the villagers together and tells them to help Luther make his party a success “for the sake of daughter.” In other words, you can still hate the father – let’s fake amity for his offspring. And organize a party (which they all wanted to attend anyway). –sound of needle scratching across record. Those people “sacrificed”? Sacrificed WHAT, exactly? She actually says, “After all they’ve done, you couldn’t drop in a ‘thank you'”! “All they’ve done” is treat us like lepers for the past few days! But nothing has to make sense any more, as long as Nora toes the line with everyone else in the inculcation factory of mediocrity. And that’s all that matters to Big Brother (aka Christ the Savior, Jesus the King, Santa the Doom Bringer, and Patsy the Hitman Elf). Movie hints at one of the major reasons people would want to avoid Christmas – to save money – a message lost immediately as Nora twists the topic into hypocrisy again. Jamie Lee Curtis starred with Dan Aykroyd back in 1983’s TRADING PLACES, when he was actually funny and she was as close to a ’10’ as a woman with a man-‘do could possibly be. Here, she looks bloated and haggard – obviously before her Activia diet – with a hairstyle that I think is called Middle America Bowl. Can we please have a moratorium on “rocking up” Christmas songs? It’s the Polishing A Turd syndrome: no matter how interestingly you arrange Mustang Sally – it’s still Mustang Sally. Playing Christmas carols with drums and electric guitars doesn’t disguise that they’re stupid Christmas carols. In fact, they sound stupider. Luther gives his precious Caribbean tickets to the grumpy old codger (M. Emmet Walsh) – one of his biggest detractors. Doesn’t the fact that Grumpy accepts the tickets not only mean he is a hypocrite, but that he is also an insurrectionist deserving of vitriol from the community now? Because now HE is going to “miss Christmas” and doesn’t the Law Of The Stalag decree that NO ONE SHALL MISS CHRISTMAS? aka: JOHN GRISHAM’S SKIPPING CHRISTMAS. Writers: John Grisham, Chris Columbus. Starring: Tim Allen, Jamie Lee Curtis, Dan Aykroyd, Patrick Breen, Cheech Marin, Jake Busey, M. Emmet Walsh, Elizabeth Franz, Erik Per Sullivan, Austin Pendleton, Julie Gonzalo, René Lavan.